Heartland Symphony Orchestra recently selected Flannery Cunningham, a PhD candidate at the University of Pennsylvania, as winner of the 2018 Composers’ Competition. Her original work, “Clarion”, will be performed by Heartland Symphony Orchestra as part of their spring concert series on Friday, April 6 at 7:30 p.m. in Crosslake, Saturday, April 7 at 7:30 p.m. in Little Falls at the Charles D. Martin Auditorium of Little Falls Community High School, and on Sunday, April 8 at 2:30 p.m. at the Tornstrom Auditorium Brainerd. The program will also feature “Scheherazade, Op. 35” by Nikolai Rimsky-Korsakov and “Pelleas and Melisande, Op. 80” by Gabriel Faure. Conductor Chats will be held 45 minutes prior to each concert. Tickets are $12 for Adult, $10 for Senior and Free for Youth K-12. For ticket information call 1-800-826-1997. The Composers’ Competition is held by Heartland Symphony Orchestra every other year, alternating with the Youth Concerto Competition. This year, the Composers’ Competition is funded in part by a grant from Crow Wing Community Trust. Composer Flannery Cunningham is fascinated by illusion and auditory perception. She aims to write music that surprises and delights. Among others, she has been commissioned by Sopraltus of the MacPhail Institute, the Minnesota Center Chorale, the Cornell University Chorus, and the College of St. Benedict/St. John’s University. She has written dramatic works including an oratorio about the 6th-century Irish monk St. Brendan the Navigator and a (pre-Hamilton) opera about the Burr-Hamilton duel. An active poet, Flannery often writes her own texts and libretti. She is attracted to both the very old and very new; she has presented on the 14th-century master and fellow poet-composer Guillaume de Machaut at the 48th International Medieval Congress and performed with Cork-based electronic ensemble CAVE at the 2014 International Computer Music Conference. In addition to acoustic ensembles she writes for live players with real-time electronics, always striving to create an environment that shows off the skills and musical voice of the performer. Flannery has also scored, performed, and sound designed for theatrical and dance productions in Oxford, UK and New York. 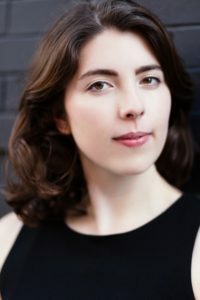 She holds a BA from Princeton University, an MA from University College Cork as a Mitchell Scholar, an MA from Stony Brook University, and is currently a PhD candidate in composition at the University of Pennsylvania in fall 2017.